You can change the size of your photo book in our offline creator tool or you can add an additional smaller size to your order in check-out. 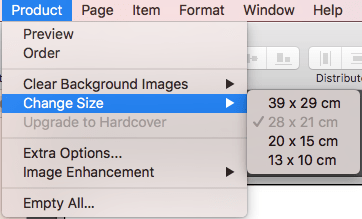 Please note: this option is only visible if there is a smaller size of your photo book available. For example, photo books with the option Premium Layflat are only available in the sizes L and square XL. You can find an overview of all our photo book sizes here. After you have finished creating your photo book, click on ‘order‘ to start the ordering process, or use the ‘reorder‘ button in your order status to reorder a photo book you have already ordered once. You will be redirected to the ordering page, where you can choose several options for your photo book. If a smaller size of your photo book is available, you will then get the option to select a smaller size in addition to your ‘normal’ size. Tick ‘yes, I’d like a smaller copy‘ and choose the preferred size, the amount you want to order and if you want glossy pages. The smaller size will be added to your products in the shopping basket. Please note: it is not possible to remove the ‘normal’ size from your shopping basket if you should use this option. You can only order a smaller size in addition to the ‘normal’ size. Please note: it is not possible to change the size of your photo book in the online creator tool or in the app. You can easily create a copy of your photo book in another size in our offline creator tools for Windows and Mac. 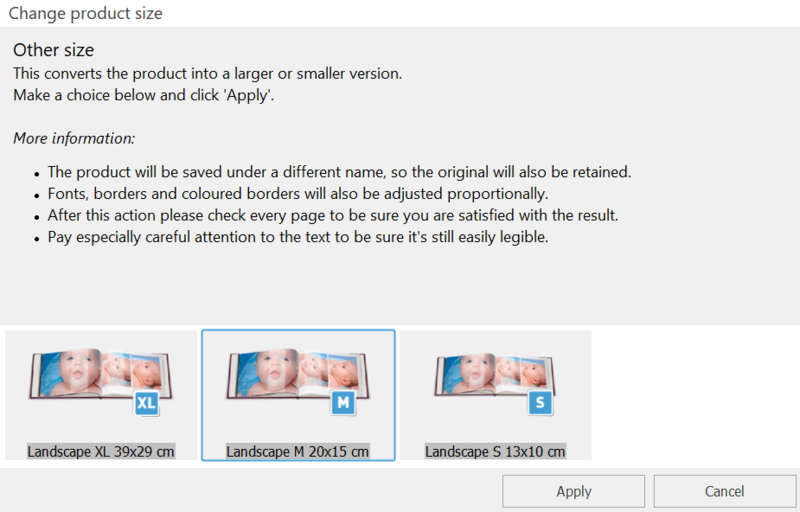 Simply open the photo book and click on ‘change size‘ under ‘product‘ in the taskbar. Select the preferred size and click on ‘apply‘. Change the title (if desired), click ‘save‘ and a copy of your photo book in the other size will automatically be generated! Please check if everything is still in the right place, because the pages could shift a little during the resizing process. Please note: if you have selected the option Premium Layflat, not all sizes may be available. Change your selection for Premium Layflat under ‘options‘ in the creator tool to make all sizes available. Open the photo book and click on ‘product‘ in the taskbar. Select ‘change size‘ and choose the preferred size. Please note: there will be no copy created. If you want the old size back, you can use the ‘change size‘ option again. 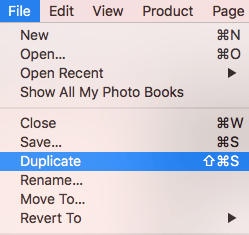 If you want to create a copy, use the option ‘duplicate‘ under ‘file‘ in the taskbar. Please check if everything is still in the right place, because the pages could shift a little during the resizing process. Now the new size is ready to order! If you have any questions, our customer service team will be happy to help!